Numerous books have cast almost too much light on the “unknown” War of 1812, so historian Howard (The Painter’s Chair: George Washington and the Making of American Art, 2009, etc.) 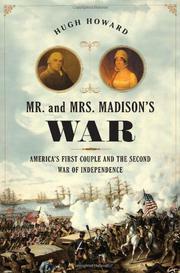 take a different tack, writing largely from the point of view of President Madison and Dolley, the nation’s most popular first lady before Eleanor Roosevelt. The author delivers a skillful history of the war itself, launched after five years of frustration at British seizure of American merchant vessels and impressment of sailors. The chief goal the American army was the conquest of Canada, which failed disastrously despite several attempts. The goal of the navy was damaging British commerce. This succeeded notwithstanding the distraction of a handful of minor but spectacular American naval triumphs, which did not prevent the immense Royal Navy from blockading our coast, damaging American commerce even more. Mostly the war was a three-year litany of inept generals, wrong-headed politicians and a sprinkling of heroes (Andrew Jackson, William Henry Harrison, Oliver Hazard Perry), whose victories made little difference in the war's outcome. British and American historians agree that it was a draw; ironically, Canadians consider that they won. Britain never agreed to stop seizures and impressment, but winning the Napoleonic wars made that moot. Dolley’s contributions to waging the war were minimal, but Howard provides illuminating asides about her activities as Washington’s premier hostess and a far more colorful correspondent than her husband. An entertaining portrait of the era’s first couple and the social life of the young nation’s elite.